The ‘U.S. 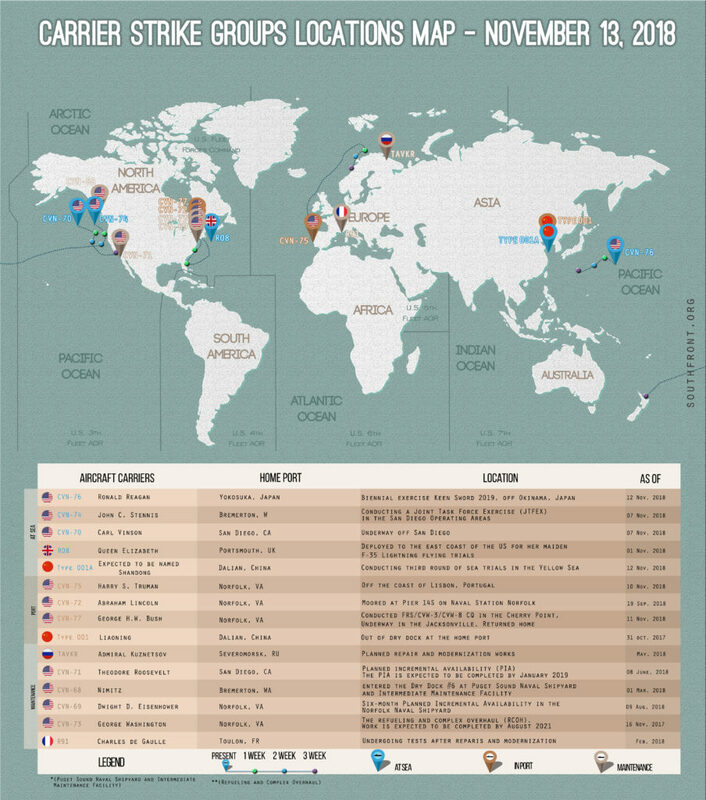 Carrier Strike Groups Locations Map’ is exclusive series showing the approximate locations of U.S. Carrier Strike Groups on a weekly basis. 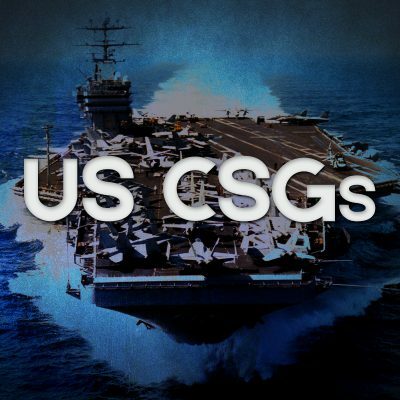 SouthFront: Analysis & Intelligence tracks locations of U.S. aircraft carriers using the available open-source information. No classified information was used in production of the maps. 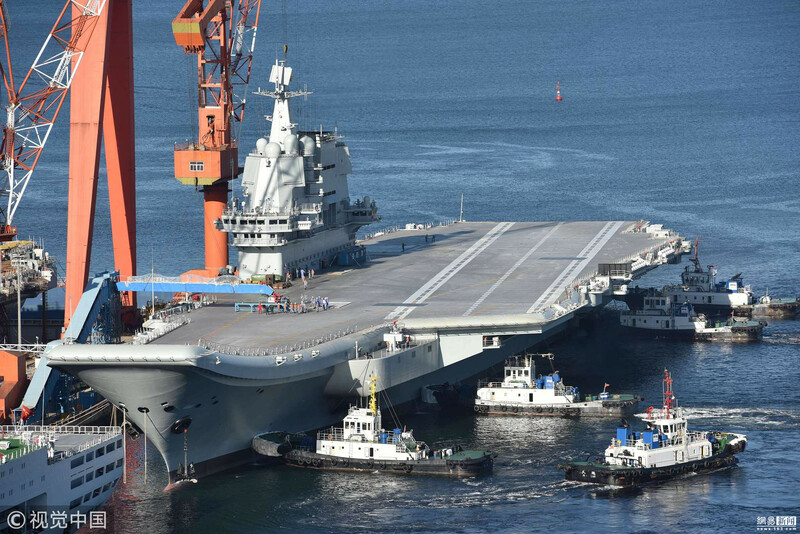 China’s First Homemade Aircraft Carrier Conducting Sea Trials In Yellow Sea 3.5 out of 5 based on 4 ratings. 4 user reviews. On October 28, China’s frist homemade aircraft carrier started sea trials in the Yellow Sea, according to Chinese media and local sources. This is the third round of sea trials for the Type 001A aircraft carrier. Nonetheless, the exact route of the trial in the north of the Yellow Sea remains unknown. The first two rounds of sea trials allowed the Type 001A aircraft carrier allowed to test its steam turbines and powerplant. The third round of the trials is set to include the further stress tests, tests of the weapons, control and communication systems as well as combat and logistic aircraft on board. You need a steam catapult guys, it’s the only way to launch heavy planes. Their catapult carrier is being constructed in Shanghai. Currently modules are being built and assembly won’t take place until next year. Not sure the rationale of having so many CVN’s when neither able seamen could man them all or available airwings fill their decks? It’s all about timing. I believe the Chinese have been building up their naval airwing, but it’s impossible to say due to the media blackout that they have on their military buildup. I was actually thinking along the lines of the USN and USA. Ah, the 3rd sea trial was recently completed last week.